There is a growing awareness that more imaginative schemes are needed to help prevent flooding. When rivers flood there are always calls for more dredging of rivers and construction of embankments and river walls, but is this really the best way to deal with the issue of flooding? 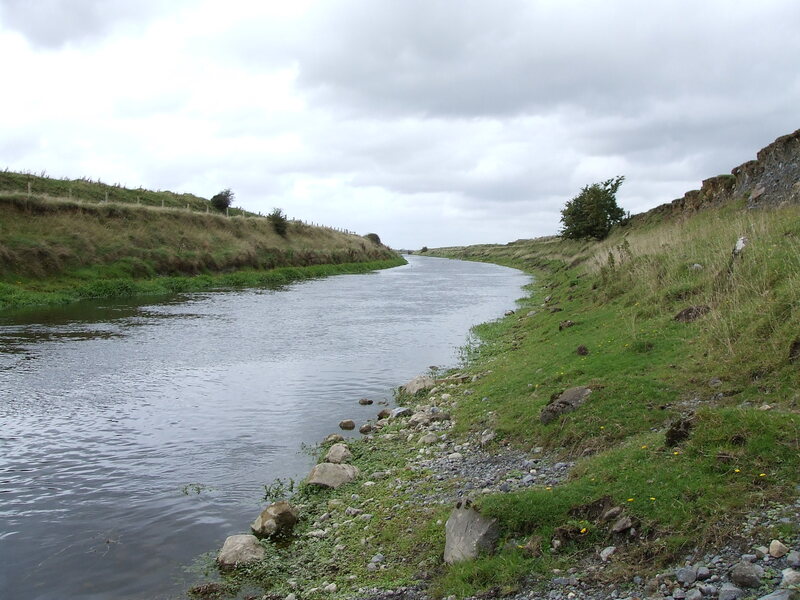 The OPW’s arterial drainage schemes aimed to get water off the land and down rivers, and out to sea as quickly as possible. 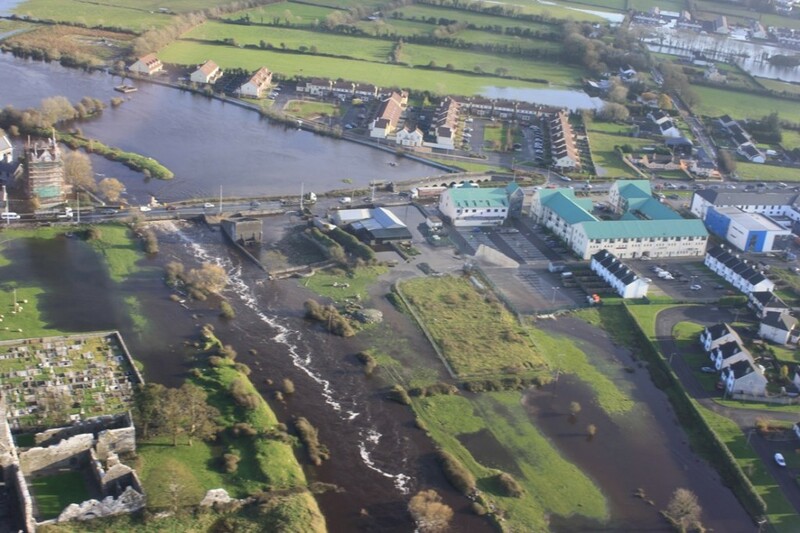 However, this just transfers problems downstream and the recent flooding of Claregalway on the River Clare is a prime example of the failure of this approach. The current proposal from the OPW in response to this is to widen and deepen the River Clare upstream of Claregalway even more. However, should we not be looking further up the catchment and perhaps restoring the old turlough systems and floodplains that retained the water previously, and generally slowing down the rate at which water runs down this catchment? This would significantly reduce flood risk and be of immense benefit to ecology. Flooding in Claregalway on the lower River Clare in November 2009. Building on the floodplain here (see old bridge on right of photo), and the arterial drainage scheme which aimed to rush water downstream as fast as possible, did not help matters here. The current plan is to deepen and widen the river upstream from here even further – should we not be looking to restore the old turloughs and floodplains instead? In a recent article in the Guardian newspaper, George Monbiot said that “river managers formerly believed that the best way to prevent floods was to straighten, canalise and dredge rivers along much of their length, to enhance their capacity for carrying water”. However, he noted that they soon discovered that this was not just wrong but also counter-productive. A river can, at any moment, carry very little of the water that falls on its catchment: the great majority must be stored in the soils and on the floodplains. By building ever higher banks around the rivers, reducing their length through taking out the bends and scooping out the snags and obstructions along the way, engineers unintentionally did two things according to George; they increased the rate of flow, meaning that flood waters poured down the rivers and into the nearest towns much faster. And, by separating the rivers from the rural land through which they passed, they greatly decreased the area of functional floodplains. How all this increased flood risk, destroyed ecological systems and cost a fortune is argued in his excellent recent article here. Dredging can make the river banks prone to erosion, and hence stimulate a further build-up of silt, exacerbating rather than improving problems with water capacity. Removing river bank vegetation actually decreases bank stability and increases erosion and siltation. In another recent article George Monbiot said that “dredging rivers won’t stop floods. It will make them worse“. The Environment Agency have said that river channels are not large enough to contain extreme floods, even after dredging. They have concluded that “dredging of river channels does NOT prevent flooding during extreme river flows“. Dredging is useless and it is counter-productive, but it keeps the farmers happy and allows the government to be seen to be doing something, according to George Monbiot. This is before we get to the significant ecological impacts of these works. The Environment Agency also say that “removing gravel from river beds by dredging leads to the loss of spawning grounds for fish, and can cause loss of some species“. Removal of silt from rivers also removes habitats for lampreys species, some of which like the sea lamprey are already at unfavourable status. Dredging rivers also causes a wide range of other significant ecological impacts . It is also very expensive and requires regular maintenance. Land does not just exists to support landowners, and waterways don’t exist just to get rid of water according to George Monbiot, and we agree with him. Lord Smith, chairman of the Environment Agency, has said that the focus of water management should prioritise protecting homes rather than agricultural land. The constant political pressure from farmers to dredge and drain rivers results in work that transfers flooding downstream to towns like Claregalway. It is clear that it is less dredging and more holistic catchment level approaches that are required to combat this issue. 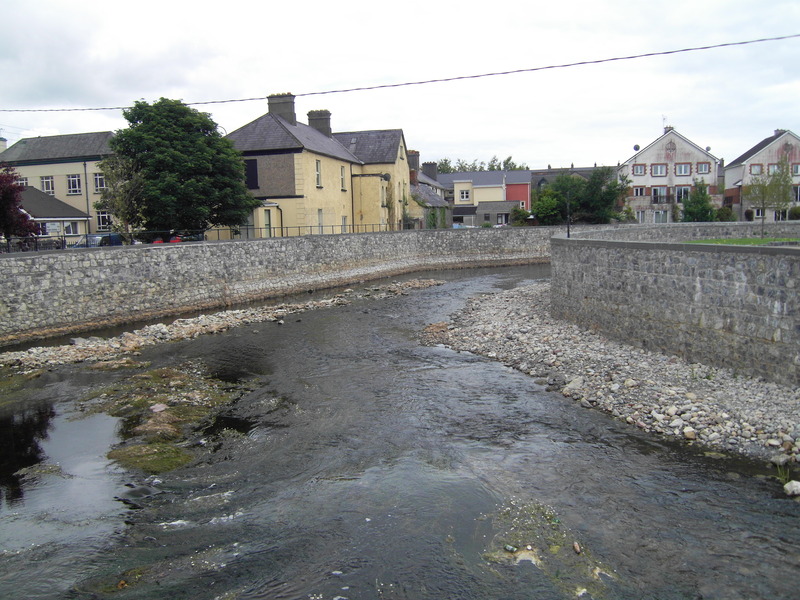 Back to nature flood schemes – an alternative to schemes like this one in Ennis? However, even engineers now agree that more imaginative schemes to help prevent flooding should be considered and promoted. The Chartered Institution of Water and Environmental Management (CIWEM) say schemes to slow river flow and reduce upstream run-off upstream cost a fraction of conventional flood walls, and should be used to compliment or replace conventional schemes. Pilot projects have involved felling trees into streams to slow down the flow, and building earth banks to catch run-off water and allow it to soak away. Water sinks into the soil under trees at 67 times the rate at which it sinks into the soil under the grass, for example. See the Centre for Ecology & Hydrology’s report ‘Effects of tree planting on agricultural soils and their functions‘. Back to nature flood schemes could be used as an alternative to the current expensive, visually intrusive and ecologically damaging river wall schemes in Ireland (i.e. 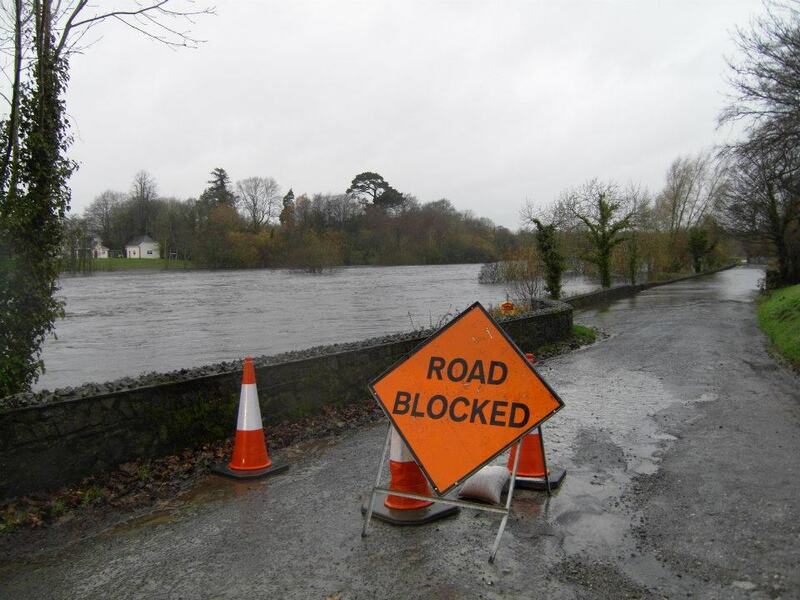 Ennis, Clonmel, Strabane), major river deepening and widening schemes, and the OPW’s national arterial drainage maintenance programme – which appears to try to do the opposite of what a back-to-nature flood scheme would do. In a recent BBC article the CIWEM said “Projects working with nature to reduce flood risk are needed right across the country”. The Environment Agency, says that there should be “a pond in every field in the areas where flood prevention is needed“. This would of course bring benefits to both wildlife and flood prevention. “Farmers will lose a bit of land – but these areas are only wet for two to three days a year and quite often they are on bits of land that farmers don’t use – boggy areas or buffer strips.”. George Monbiot argues that farmers are being subsidised to do the opposite of what is really required to manage floods. He blames the Common Agricultural Policy for much of the damage that has been done to UK river catchments, and believes that the subsidies given to farmers should be used for projects that benefit society and not just the farmers themselves. Green group WWF said “farmers should get subsidies only if they agreed to create small floods on their own land to avoid wider flooding in downstream urban areas“. Of course this approach may not be practical in Ireland, where farmers are in no doubt of their entitlement to receive public money for their enviable position of owning land, and are currently threatening to clear all natural habitats from their lands if their EU subsidies are reduced. The Wildlife Trusts have also called for a restoration of natural flood defences, urging the government to restore broken ecosystems and stop building on floodplains.“It really is unacceptable to have had thousands of people in communities up and down the country devastated by these floods when we know there’s a better way to deal with flooding”. There are alternatives to costly and invasive concrete wall defences, and the other approach of draining lands, dredging rivers, and trying to rush the water to the sea as quick as possible. A recent article in the Ecologist argues that it is time to bring back nature’s flood management engineer – the beaver! This article makes the point that “many small floods upstream prevent big floods downstream“. So since “beavers create multiple small floods, ponds, pools and wetlands upstream“, they “have the capacity for mitigating the impact of flooding“. This very interesting article can be accessed here. Another recent article in the Ecologist is also relevant here. Mike Townsend of the Woodland Trust says that “trees, woodlands and hedgerows do much more than enhance the appearance of Britain’s rural landscapes, they diminish flooding, reduce erosion, assist water infiltration, enhance biodiversity – and we need more of them“. The UK government is discussing new rules to stop farmers contributing to flooding through poor land management. Experts say careless farming has made floods worse in Somerset and elsewhere. Read more on this in the following article entitled “Careless farming ‘adding to floods’” from the BBC. Also from the BBC, in this video entitled “How restoring peat bogs could prevent flooding” Roger Harrabin looks how the Exmoor peat bogs are being restored to their natural state to help soak up water – preventing it running off into rivers and causing flooding further downstream. The CIWEM report ‘Dredging & Floods – time for a reality check’ is available at this link. Also see the articles ‘Dredging up Trouble‘ and ‘Dredging can make flooding worse, say activists‘. O’Connor, W., & McDonnell, D. (2008) Report for the Ecological Assessment of the Significance of Impacts of proposed scheduled Arterial Drainage Scheme channel and embankment maintenance works on SACs & SPAs. A Report to the Environment Section of the Office of Public Works. ECOFACT is Ireland’s leading independent environmental consultancy and we have extensive knowledge of designing components of back to nature flood schemes, and providing consultancy on sustainable catchment management. For more information contact us here. do not build in places that will flood will be a start, put people before profit, then remember the planet needs to grow and we are just using it for a short time, sooner or later it will get fed up of us, can you blame it, it was here before us and owes us nothing, we are the ones taking!